Details What is Kismet ? English spelling not yet checked! 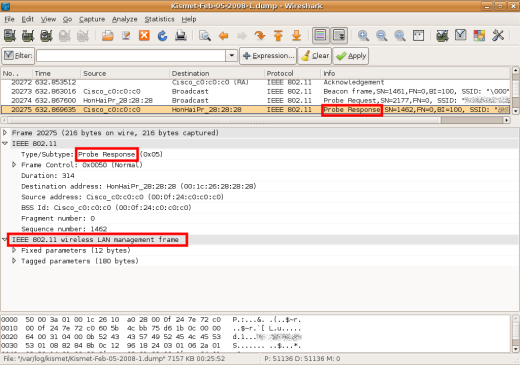 802.11 is a set of standards for WLAN (Wireless Local Area Network) defining Wireless data. 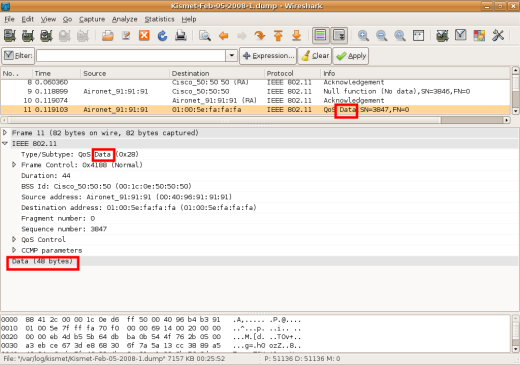 It is currently mainly composed of three protocols: 802.11a, 802.11b and 802.11g. 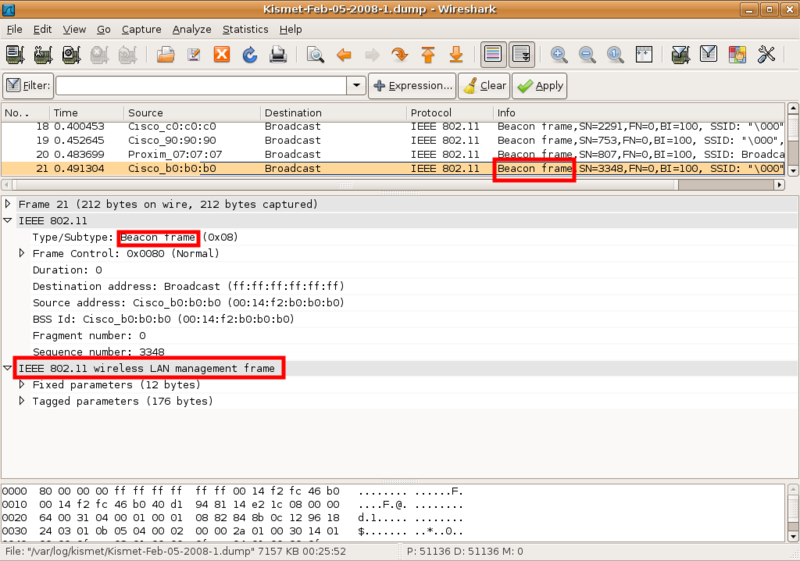 A new protocol called 802.11n should be released in 2009. It is already implemented in some wireless card and access points in a draft state. Note that this is not possible to reach the maximum data rate indicated by the manufacturers. In optimal conditions, about half this value can be reached for 802.11a/b/g and 1/3 for 802.11n. It is not permitted to transmit Wireless data at any frequency, only some ranges around 2.4 Ghz and 5 GHz are allowed not to enter in conflict with other type of waves such as the one used for the mobile telephony (GSM) or the radio. Other rules are imposed to wireless hardware such as maximum transmission power. Data can be transmitted through 13 channels. In a multi access-points environment, the channel number must be set carefully on each access point to avoid wave interference leading to poor transmission rate for the wireless users. 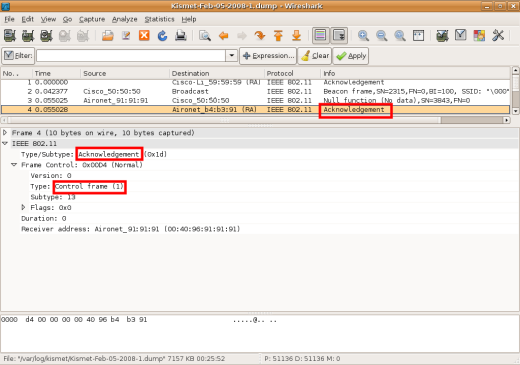 The "infrastructure" mode is used when a wireless client such as a laptop is connected to a Wireless station called Access-Point. This mode is used most of the time. The "Ad-Hoc" mode is used when two hosts want to communicate directly between each other without traveling through an access point. - Control frames: Help the data frames delivery. - Management frames: Establish and maintain wireless communications. - Data frames: Transport the data. Press the "p" key in the kismet main interface to see the captured wireless frames. Check the wi-fiplanet website to get details about each frame type. Here are examples of one control, data and management frames. 0010 ce 67 3d e8 68 30 6f 7a 5a 13 cc 38 89 a5 46 84 .g=.h0ozZ..8..F.
If the AP is set not to broadcast its SSID, it will answer to a probe request with a blank SSID field. Beacon Frames are sent regularly by access points to help wireless clients to identify them. 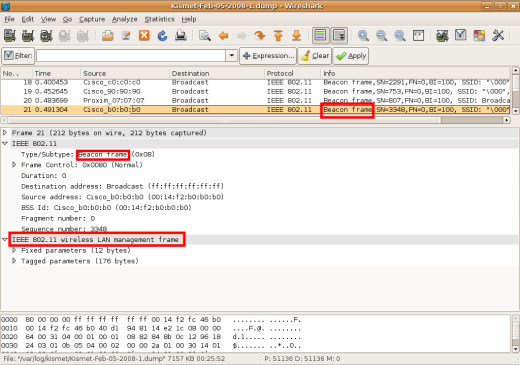 In the beacon frame body, information similar to those found in "probe response" is displayed, such as the network name (SSID), supported rates, AP name, AP manufacturer, etc ... . In an idle network, beacons dominate all other traffic. If the AP is set not to broadcast its SSID, it will send beacons with a blank SSID field such as in the capture below.